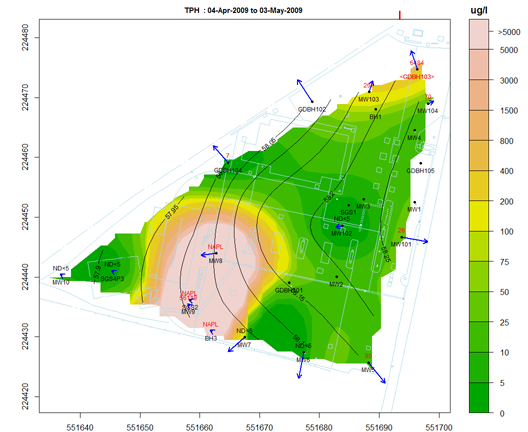 An open source, user-friendly, software application for the visualisation and interpretation of groundwater monitoring data. A spatiotemporal model provides a more powerful analysis than spatial modelling at isolated time points or temporal modelling at isolated locations. 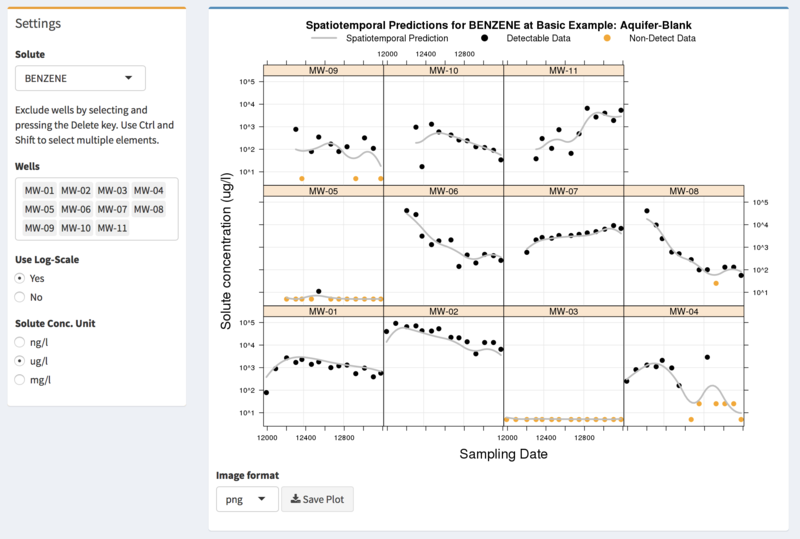 Visualisation of site-wide trends in solute concentrations, with interactive control. 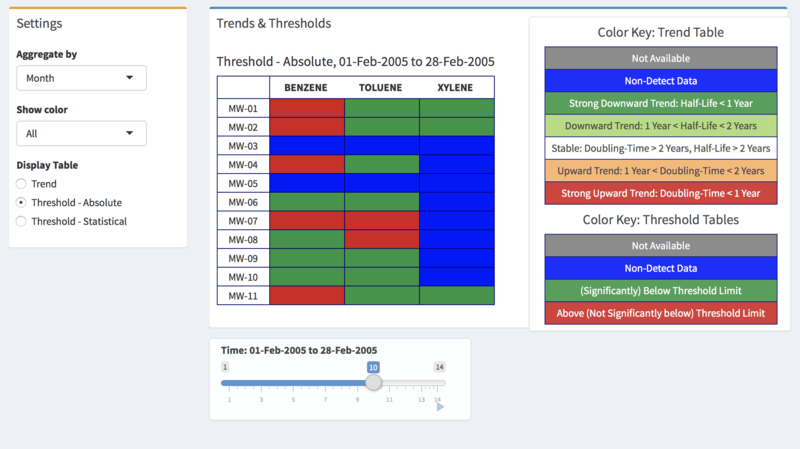 Trend and threshold matrices can be constructed as summary indicators. Ease of data entry through a MS Excel spreadsheet containing well co-ordinates and solute concentrations at specific times. Wells can be grouped into separate aquifers. Site maps can be added as GIS shapefiles. 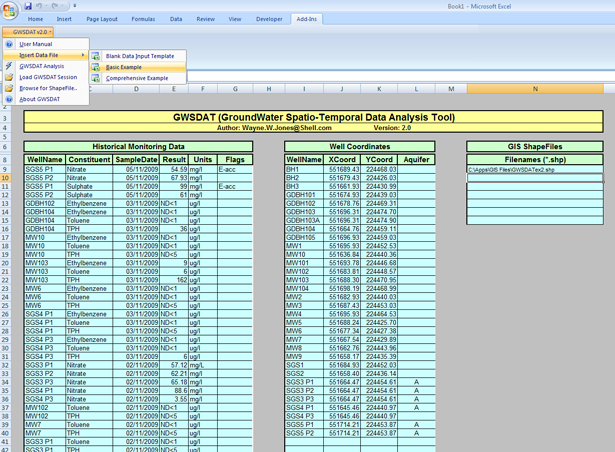 Automatic report generation tools, including site reports and spatial plots at user specified times with groundwater and NAPL data overlaid. Plots can be exported directly to MS PowerPoint. The simplest form of access to GWSDAT is through the on-line tool. 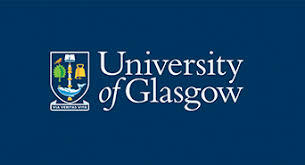 Guidance on use of the tool is available in the Getting Started page. A version of the tool which can be installed locally is available either as an R package from CRAN or as an Excel interface from the API and Cl:aire. The modelling of solute distribution in groundwater, based on data from monitored wells, is commonly restricted to the analysis of trends in individual wells, or to independent fitting of spatial concentration distributions by methods such as Kriging. Neither of these techniques satisfactorily elucidate the interaction between spatial and temporal components of the data. GWSDAT applies a spatiotemporal model to create a coherent interpretation of patterns of groundwater solute concentrations over space and time simultaneously. Monitoring data is entered as a simple MS Excel spreadsheet. The fitted spatiotemporal model can be displayed in graphical form or exported in numerical format. The video opposite gives an illustration of a fitted spatiotemporal map. Rapid interpretation of complex data sets from monitoring networks, including small installations such as fuel stations and large installations such as refineries or terminals. More efficient evaluation and reporting of groundwater monitoring trends through interactive visualisation and simple, standardised plots and tables generated automatically. Early identification of new releases, migration pathways, need for corrective action and stable/declining trends that may aid in closure determinations. Increased data transparency leading to improved design and optimisation of groundwater monitoring or remediation programmes, in particular avoiding the collection of redundant data.